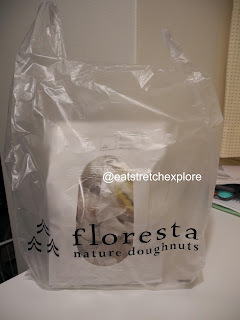 In my Korean guidebook, there was a recommendation to try Floresta Nature Doughnuts. So, during my first week in Kobe (obviously the week of halloween), before I met some of my Japanese friends from college in Nara, I went and picked up some Floresta doughnuts from the Sannomiya store. For some reason or another, Japan is obsessed with doughnuts. Like ridiculously obsessed (I guess Korea is, too, but Korea doesn't really have their own doughnut chains like Japan does). In their infinite wisdom, Japanese doughnut brand shops have set out to make a "nature doughnut" and a more healthy doughnut...the opportune word is "more." 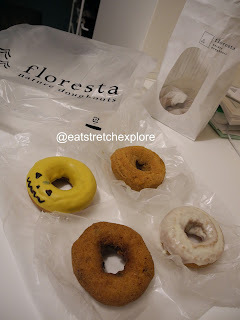 Actually, to make my purchase kind of silly (I was carrying these doughnuts around Kobe, through Osaka station, and all the way to Nara, there is a branch of Floresta doughnuts in Nara. I think it may have actually been the original store, but I am not entirely sure of that since I do not know Japanese. My friends were laughing because Floresta came out on the map of Nara as a food option. (The food map is only available in Japanese...for your reference). If you are in Kobe, the store is located near Tor Road/Hankyu station. Just keep walking along the tracks and you will come to it right after Tor Road. By the time I got to the store, it was only open for another hour and there were only some slim pickings available since they only bake as needed. The one I really wanted to try (Earl Grey) was not available, but I was able to get the Milk flavor, 2 seasonal flavors (one was Jack-O-Lantern glazed and the other chestnut flavor) and one cinnamon flavor and one sugar flavor doughnut. The price was pretty average, but slightly higher than chain stores like Krispy Kreme and Mister Doughnut. Floresta's claim to fame is using higher quality, natural/organic locally-sourced, ingredients, so that explains the price. The milk and cinnamon were 150Y each and the seasonal ones were 180Y each. Since we weren't going to eat it until the next day, I was kind of worried about the doughnuts getting kind of stale and dry, but even though they were consumed the next day, they were still moist. The flavor was not overly sweet and the doughnuts were not overly greasy like the ones you get at some international chains. I heard the chestnut flavor was very good. The milky flavor glaze was sweet, but not overpoweringly sweet. The cinnamon flavor was also quite good. It was just the right amount of cinnamon...not so much that you sneeze but subtle enough that you know you were eating cinnamon. I recommend you try the milky and cinnamon flavors. Other recommended flavors from my guidebook include: chocolate, nature, earl grey, and chocolate. UPDATE (06/16/2014) - DISCLAIMER I haven't tried these locations. There are floresta nature doughnuts locations in Seoul now! It is located in Chungdam. From Chungdam station (line 7) exit 5, walk straight until you get to a Woori Bank. At the Woori Bank, turn left and walk a little bit. It should be on your left. From Apgujung station (line 3) exit 5, walk straight until you get to the Hana Bank, then turn left. At the first road, turn right. Walk straight past the first street. From there, it should be located on your right in the second building.